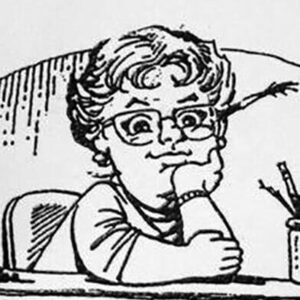 The comics career of Will Eisner Hall of Fame artist Marie Severin (1929-2018) spanned six decades and included stints at two of the medium’s most renowned houses- EC Comics and Marvel. Known primarily as a colorist, Severin used the limited color palate of comics in new and inventive ways, bringing to life the drawings of some of the biggest artists in comics. As her career progressed, Severin was given more opportunities, eventually drawing characters like Doctor Strange, the Hulk, and Thor. But as one of the only women working in mainstream comic art, she felt constrained by sexism in the industry and eventually struck out on her own. To mark Women’s History Month, the Browne Popular Culture Library is displaying some of Severin’s most prominent early work, showcasing her distinctive style. The exhibit also offers a chance to see original Severin watercolors created as color references for a 1971 issue of The Mighty Thor, which have not been shown in public since the mid-1970s. The display is open to the public and will be on view through March 31st.